Our life is full of things that we want to remember and share with our close people. Travel adventures from a recent holiday, family or business anniversary, baby’s first steps, son’s or daughter’s graduation, a new pet in the house… – all those big and small events present an occasion to get together, and share our memories of the past and hopes for the future. Viewing photographs together is an important part of such events. Why not make it more fun? 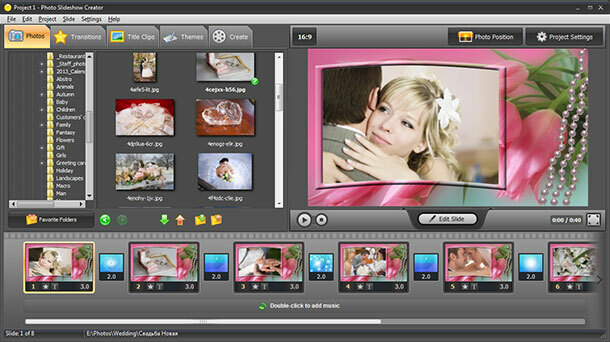 Make a picture slideshow with music - it will entertain your guests, or make a great gift to the person of the day! Today’s slideshow is not just a series of pictures shown one by one. A thoughtfully prepared picture slideshow combines tastefully designed slide templates, often with some text captions, fascinating transition effects, and catchy music. Many agencies offer their services in this field. However, giving this job to a professional is not the only way out. You will have a lot of fun, and save a good deal of money, if you make a picture slideshow with photo slideshow software. It’s surprisingly easy, even if you are completely ignorant when it comes to computers, while the rich slide templates and transitions collection will inspire you on creating delightful presentations! Here’s how to make a picture slideshow with Photo Slideshow Creator from AMS Software in a few simple steps. 1. Prepare your photos. The best thing to do is to gather them all in one folder. When you run the program and start the project, you can add the whole folder with one mouse click – press the folder icon with the green arrow under the Folder View panel. You can also drag and drop single photos to the storyboard at the bottom. If you'd like a fancy slide background, choose one from the Themes tab. 2. Customize the transitions. Depending on the occasion, your slideshow can be slow and meditative, or dynamic and full of energy. It’s important to select suitable transition effects from over a hundred available – therefore sometimes it’s better to change the transitions inserted by the program automatically. Open the Transitions tab and double-click on the icons to preview what each effect looks like. After you’ve chosen the one you like, click Apply to all. If you want to highlight certain slides, use a different transition – just drag and drop it between the two slides. 3. Add a soundtrack. Choose a song or an instrumental piece that fits the mood of the slideshow and is relevant to your audience. Make sure your sound file is .mp3 or .wma format. Double-click on the Music bar at the bottom, and add one or several music files. 4. Press the Play button to watch your slideshow in full-screen mode. If you are fully satisfied with the result, it’s time to decide what you do next - Make a Slideshow for Facebook, Burn Photos to DVD, Make a Slideshow for YouTube, or a Slideshow For Mobile Phone. And these are only some of the possible options! You will see them all and many more when you go to Create tab. Simple instructions will lead you through the rest of the process. Now that you see how easy it is to make a picture slideshow, it’s time to try it yourself!